Stunning Hardwood Decking ... and a Clear Conscience! 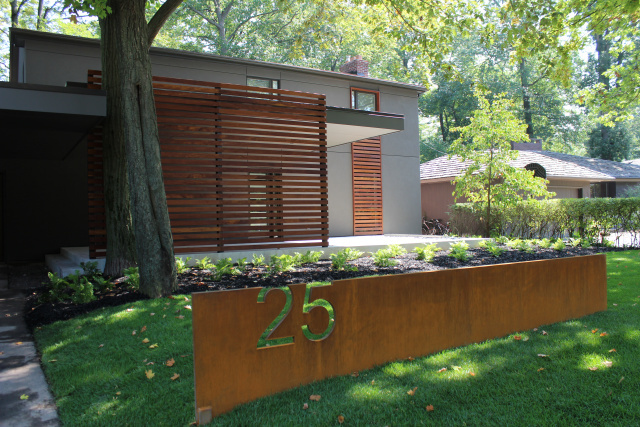 Sandeka hardwood is the decking for which we are most proud. It is a decking line we have developed and introduced exclusively for it's exceptional value, durability and good looks. Sandeka hardwood has a warm medium-brown hue and offers the most consistent colouring of any tropical species we have encountered. It has a wavy flowing grain pattern that is very pleasing to the eye, particularly highlighted on large surface areas like decks and docks. We only offer Sandeka hardwood decking in a premium clear grade. Although many customers mistake Sandeka hardwood for Ipe, when placed directly side by side Sandeka hardwood is a lighter and warmer brown. Sandeka hardwood is quite consistent in colour, whereas most tropicals exhibit a wide spectrum of colours and shades. Ipe, for example, can range from boards that are extremely dark to lighter boards which are virtually identical in colour to Sandeka. From a hardness and durability standpoint, Sandeka hardwood lies just below Ipe (which is the hardest and longest lasting of all outdoor decking materials). 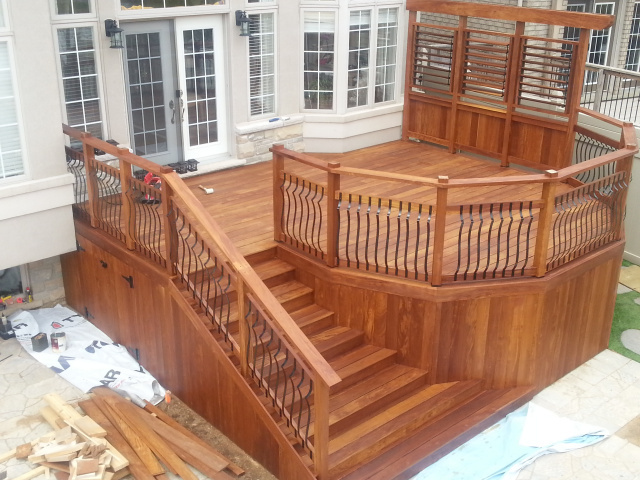 It is harder and more durable than mid-level hardwood decking species like Garapa and Tigerwood. It's workability is surprisingly good (it cuts and shapes well) considering how hard it is. It is less dulling on tooling than Ipe, and the sawdust produced is less irritating. Our exclusivity on Sandeka hardwood gives it a valuable advantage - we are able to control the supply chain which allows us to keep supply costs in check and ensure excellent board quality and consistency. It also allows us to have the boards hand-oiled on all four sides with Messmer's UV+ for Hardwoods right at the mill. This saves considerable cost compared to using expensive Canadian labour to do it either at our Ontario facilty (which we offer for our Ipe decking) or at a customer jobsite. It also means the boards are oiled right from day one before they are exposed to surface dust and contaminents during transport to Canada, storage at our warehouse, or installation on a jobsite. Preoiling on all four sides offers tremendous advantages, even for those customers who intend on letting their boards weather to grey. It helps keep mill dust and jobsite dirt from getting imbedded in the wood grain and it protects the boards from the water and moisture they might be exposed to prior to being laid down (this helps board moisture content remain consistent during board installation). Perhaps most importantly, it allows the boards to acclimatize more slowly to their new environment which helps reduce checking and board movement. Preoiled boards look amazing right from day one, and they aren't subject to any greying/weathering while the homeowner or contractor waits for suitable weather to oil a new installation. Also, oiling before installation is the only practical way to oil and protect the bottom face and edges of your deck boards! By working directly with our mill, local harvesters and local communities we have been able to make Sandeka hardwood a truly environmental decking product. By controling demand we can ensure over-harvesting does not occur. We utilize many small local harvesters that pull our Sandeka logs by oxen (zero emissions and no huge skidder paths scarring the forest). Also, Sandeka hardwood is milled from very dense but smaller and shorter trees than the massive trees required to produce most tropical hardwood and western red cedar decking. Although this means longer lengths are more limited, it also means we don't need to chop down giant trees that serve as the pillars of forest ecosystems. Also, by utilizing local labour for everything from harvesting to replanting to hand-oiling the boards, we are able to keep as much revenue as possible within the tropical region where it's truly needed and appreciated. Sandeka hardwood does not leach chemicals into our neighbourhoods and lakes like pressure treated lumber. It doesn't decay and need to be replaced with newly harvested wood every decade or so the way cedar and redwood do. It is not manufactured from non-biodegrading chemicals in an emmission-producing industrial plant as are composites and PVC decking. The many reasons outlined above form the basis of our pride in our Sandeka hardwood decking products. We feel Sandeka is truly the best all-around choice for outdoor wood applications - it is totally natural, it lasts for decades, and it looks absolutely stunning. We hope you feel the same way! When ordering 10-13 ft lengths add 10%, 14-16 ft lengths add 20%. Although our $12.99 flat rate delivery fee does not apply to hardwood or tiles, our delivery prices are incredibly low - call or email for a quote. Please note that to prepare a quote we will require either a cut list (board profile + length + quantiy), or linear footage requirement (board profile + linear footage), or at a minimum square footage requirement (board size + square footage). It is wise to add 3-5% extra contingency material since the cost and inconvenience of picking up a few extra boards is often much greater than the actual material cost of the extra boards. The determination of what and how much wood is required is most often determined by the builder since they should have that expertise and are usually the party responsible for ensuring appropriate wood is ordered to complete the project to the owner’s satisfaction. We have a great deal of expertise in relation to the actual wood and accessory products (oil, fasteners, tools, etc. ), however our expertise does not extend to actual deck design and material requirements. If any questions arise regarding what products to use for the installation please call or email us and we will be more than happy to offer suggestions and advice. Once we're provided with the desired material list we’ll verify stock and email a detailed material quote. When sending material requirements it is helpful to include the approximate delivery date as that has an impact on our projected inventory available.